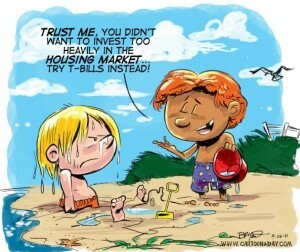 I’d rather own a sand castle than Treasuries. Last week the 52 week T-Bill yield was .18%. In other words…. lend the government $99,820 and they pay you back $100,000 in a year. You lock in $180 profit on your investment. For almost no risk. Or… with that same $100k, you could buy a perfectly rehabbed rental house in a nice neighborhood. At the end of the year, after taxes, insurance, maintenance and professional property management, you would passively pocket at least $6,000. $6k in annual rental income… even if the house never went up in value. With minimal risk. Oh… by the way… did we forget to account for inflation? Even the most optimistic projections are betting inflation will exceed 2% for the next year. So your T-bill is really going to lock in a loss of about -$1,820. That’s right… it’s no risk… but you automatically lose money…. By contrast, your rental house will make you $4,000 AFTER inflation….and you will probably raise rents next year. I guess it all depends how you define risk, right? How do YOU define risk? What returns are YOU looking for? Please leave a Comment or share this post. This entry was posted in rentals and tagged inflation, interest, investing, real estate, rental, yield by David Midgett. Bookmark the permalink. Pimenta disse:Bosco, Meu tardio, porÃ©m sincero agradecimento pelo eseearlcimento.Relamentc, existem parÃ¢metros para serem colocados de forma clara e unÃ­ssona, e cada um “puxa a sardinha para a sua brasa”.Abs! Nerd disse:Paulo, De uma olhada nos logs do Samba (/var/log/samba/*.log). Pode ser que encontre referÃªncia para qual o parÃ¢metro que sua versÃ£o do kerberos nÃ£o estÃ¡ entendendo.NErd.